I am constantly on the search for further invaluable contemporary letters from soldiers serving in the British Army during the Napoleonic wars, however this is one I have known about for some time, but one that has waited for me to finally stop procrastinating and to tackle the very difficult handwriting and very feint ink, which means that they may well be lost to us forever soon. The letters are kept in the India files at the British Library and are therefore little known, but finally they will now enjoy the limelight that they so richly deserve. George Ulric Barlow was born in Calcutta on 8 October 1791, the eldest son and second child of Sir George Hilario Barlow, Governor General of Bengal and Elizabeth (nee Smith), having married in India on 16 April 1789. Sir George was then acting Governor General of India from 1805-7 until the arrival of Lord Minto. He had been made a baronet in 1803 and a Knight of the Bath in 1806 and Knight Grand Cross in 1815. Sir George had four other brothers, William who resided in Blackfriars, London or at his country house at Streatham and became young George’s ‘father figure’ whilst in England. His Uncle Robert served in the Royal Navy and commanded at Chatham Dockyard for many years, Samuel had died in 1791 and Thomas William who entered the clergy and became Vicar of Halberton in Devon. His two sisters (young George’s aunts) were Frances Charlotte and Harriet Hilare. When our George was old enough, he was shipped off to England for his education and he was sent to Eton School. Being separated by so many miles from his family and with an ability to only correspond with his parent via the two great ‘India convoys’ per year, it was natural that he would build a close relationship with his Uncle William, a trader based in London. The Barlow’s were not slow to produce a very large family of fifteen children and George soon had many siblings, with whom he generally seems to have had a close relationship, despite being away from them for many years. Eliza Harriet had been born in 1790 and following George’s birth in 1791, there were William in 1792, Charlotte in 1794, John Henry in 1795, Robert in 1797, Louisa in 1798, Charles Anstruther in 1800, Frances in 1802, Harriet in 1803, Anne Caroline in 1803, Richard Wellesley in 1804, Edward Frederick in 1807, Emma Drury in 1809 and Frederick in 1810. Frederick’s birth was to cause huge issues, it was seemingly known later that Frederick was not fathered by Sir George. This led to an acrimonious divorce, citing Colonel George Pratt Barlow, a cousin of Sir George and his aide de camp in India, as the father of this child. The scandal leaked out to the Times newspaper and Colonel Barlow set up home with the former ‘Lady Barlow’ in Kensington until her death in 1836. George finally left Eton in the summer of 1809 and he wrote a note to his Uncle William, giving him his thoughts on the school and the education that he had received there. But now George needed a career, something his father had clearly not failed to provide for; his influence in India certainly helping his rapid advancement from ensign to lieutenant on his very first day in the army, in regiments who just happened to be in India and without purchase! Within three months he had transferred again into one of the most sought-after regiments in the army, after the Household troops, the 52nd (Oxfordshire) Regiment, made famous by its connection to Sir John Moore. George then served with the regiment for the next four years, seeing much action in Spain and Portugal and being severely wounded on at least two occasions (at Badajoz and at the Nivelle), before he transferred from the 52nd Foot to the 69th (South Lincolnshire) Regiment, with which he served in 1815 at the Battles of Quatre Bras and Waterloo and partook in the subsequent march on Paris. Returning home to England and a period of half pay, he married his first cousin, Hilare in 1817 and then gained a captaincy in the 22nd Light Dragoons on 17 August 1820 which was then disbanded. On 5 April 1821 he transferred to the 4th (Queen’s Own) Light Dragoons on full pay and he soon sailed for India with his regiment and wife Hilare from Tilbury Docks on 31 December 1821. The couple enjoyed two and a half years at the cantonment of Kaira, near Ahmadabad. Unfortunately, however in what seems to have been a major outbreak of malaria in June 1824, which carried away no less than 89 officers and men of the regiment that year, George Ulric Barlow was included in the death toll. If George had lived to gain his Military General Service Medal, which was eventually issued in 1848 but retrospectively covering all major operations since 1800, he would have been eligible for a medal with five bars, having served at the sieges of Ciudad Rodrigo and Badajoz and the battles of Vitoria, the Pyrenees and Nivelle. He was also at the action of San Millan and visited San Sebastian whilst the French still held out in the castle which would not have earned him a bar. We are very lucky that his family avidly hoarded letters as we have not only his fulsome but slightly staid letters written to his father every six months, but a much more regular and lively correspondence with his Uncle William which deal in great minutiae with his everyday activities, cares and woes and also his more jocular and fun-loving epistles to his old school chum Andrew Amos. This does raise the question as to how all of these letters came to reside in his father’s correspondence. It is clear from the letters, that his Uncle William was sent his sealed letters, addressed to his father in India, to be sent with one of the two India convoys per year. But moreover, there are hints that Uncle William was also forwarding his own letters from George to India once he had read them and it would appear that George knew this and yet he felt honour bound to write his more formal letters to his father as well. How the letters to his friend Amos also appear in these files is anybody’s guess, but it is likely that he also chose to forward them to George’s father in India after he had read them. Between them, although there is some inevitable duplication, we gain a very comprehensive and often very unique picture of the life and troubles of a light infantry officer during the Napoleonic wars. He also raises some very interesting thoughts regarding the 52nd, as both an ‘elitist’ regiment, with John Moore portrayed as someone who actively singled out and recruited officers only of ‘high standing’ and as regards to the regiment, describing it being very much a ‘Scottish regiment’ in its make-up. The 52nd Foot are already well represented, having a number of memoirs published from the period of the Napoleonic Wars – not forgetting the correspondence of Sir John Moore himself – including Lieutenant Colonel George Napier (1809-12) Lieutenant John Dobbs (1809-13), Lieutenants Charles and Henry Dawson (1811-14 and 1809-12 respectively) and Ensign William Hay (1810-11). Added to which, I have already published those of Captain Charles Kinloch (1806-16) and Captain John Frederick Ewart (1811-12) . So, the obvious question must be, does George Barlow add anything else to our understanding? To which the answer is, yes, in spades. From his pretty well unique description of light infantry training at Shorncliffe, to the inner workings of both the 52nd and 69th regiments on campaign, they are invaluable, covering much of the minutiae of everyday soldiering, too often ignored by his contemporaries. 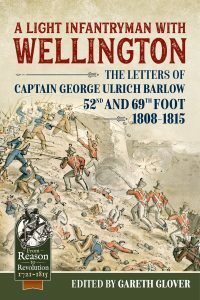 I thoroughly recommend his letters to any serious student of the British Army during the Napoleonic wars.